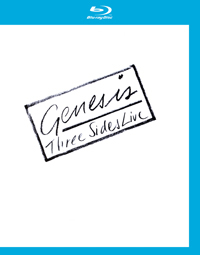 You can now pre-order Genesis' digitally remastered Three Sides Live on Blu-ray and DVD! Available November 4th in North America. You can now order the Genesis R-Kive 3-CD compilation spanning the works of Genesis, plus solo works! AVAILABLE NOW! Click here for more of the latest releases in the world of Genesis! Click here to get virtually every CD, DVD, and more currently in-print (many collectible items, too)! WELCOME TO WORLD OF GENESIS.COM! This site is designed with the Genesis fan (and collector) in mind. Everything from the latest news, tour dates, releases on CD & video, a regularly updated discography, rare collectables, exclusive interviews with the artists, links to buy your favorite Genesis related goodies, album and concert reviews, and more are featured here. Whether you're a fan of Genesis, Phil Collins, Peter Gabriel, Tony Banks, Steve Hackett, Mike Rutherford, Anthony Phillips, or Ray Wilson, you'll find the hottest information on the 'Net right here. Plus, this site also features related artists like Chester Thompson and Daryl Stuermer (who regularly toured with Genesis from 1977 and 1978 respectively until 1992 - and again in 2007) and Paul Carrack and Paul Young formerly of Mike Rutherford's successful Genesis related side project, Mike & The Mechanics. As I have learned in the past decade, this site is a continual 'work in progress', check back soon for more updates and additions! Exclusive Genesis R-Kive CD and t-shirt Contest! Enter now! Steve Hackett's Access All Areas available this month! Check out the latest reviews on Genesis related artists' albums, videos, tours, books, and more! Get one person's honest opinion about projects in the world of Genesis... Do not assume that because I am a fan that the reviews are not critical! Check out biographies on all of the artists in the world of Genesis! Features brief and informative biographies. Great for fans and casual listeners alike! Read exclusive World of Genesis.com interviews with many musicians in the world of Genesis including: Tony Banks, Bill Bruford, Steve Hackett, John Mayhew, Anthony Phillips, Mike Rutherford, Chris Stewart, Daryl Stuermer, Chester Thompson, Nir Z, and more! Check out the World of Genesis.com discography for a fairly comprehensive listing of collectible CDs, LPs, cassette tapes, 8-tracks, reel to reels, DVDs, VHS tapes, VHDs, Laser Discs, and more! Looking for links, contests, more information on World of Genesis.com, or Genesis related goodies like video clips and much more on the Internet? This is where you want to go! Check it out! Get News & Information In Real-Time!